How was your weekend? For me, a "fun weekend" is being able to fit everything in whilst still being able to relax and enjoy doing a little of nothing. I love doing nothing even if it is only for just 10 minutes. Do you too? A "great weekend" is still being able to fit everything in, getting to enjoy some family time and completing a craft or decor project. It is the small things in life that make me very happy ;-). I like to remind myself of that this time of year because it can get a little crazy busy, wouldn't you agree? I loved this deckchair from the moment I saw it. It had such a strong frame and was beautifully made. 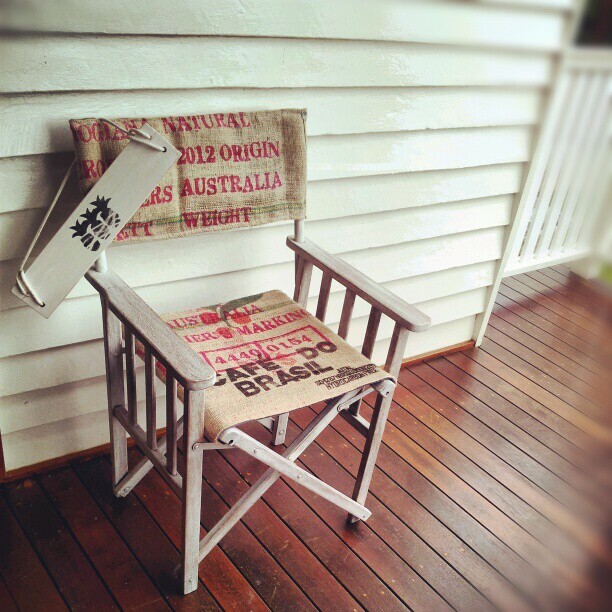 It was rather unloved and faded when I found it; nothing a sand, white wash and coffee- sack revamp couldn't fix though. I particularly love the red- pink colour of its branding stamp. Loving doing deck-chair revamps right now! So tell me, what have you been up to? Popping over to Tanya's, come check out her rad vintage ladder. Rachel it's lovely. She looks very happy out there on that lovely deck. I loved your chair from the moment I saw it too!! This is a gorgeous revamp Rach... haven't seen sacks used in this way before and I really love it!. looks fabulous, I need a coffee sack as pretty as that! What a great makeover, looks fantastic! Your a luff, thankyou Tania! Thanks Deanne! You can get some pretty coloured sacks these days, so very colourful.